We love the smell of facts in the morning. Here are some things you might not have known about director Francis Ford Coppola’s loose adaptation of Joseph Conrad’s Heart of Darkness. 1. SCREENWRITER JOHN MILIUS WAS INSPIRED TO WRITE THE SCREENPLAY BECAUSE OF HIS COLLEGE ENGLISH PROFESSOR. Milius credits his obsession with war from never getting to fight in one. Milius attempted to volunteer for the U.S. Marine Corps to fight in the Vietnam War in 1968, but was deferred due to his asthma. Instead, he studied film at USC with fellow classmate and Star Wars creator George Lucas. There, during a lecture, a professor named Irwin Blacker convinced the class that no screenwriter had ever perfected a film adaptation of Joseph Conrad’s novella Heart of Darkness. The would-be filmmaker’s Vietnam-focused mind and Blacker’s challenge gave Milius the idea of combining the two in what would eventually become Apocalypse Now. 2. IT WAS ORIGINALLY SUPPOSED TO BE DIRECTED BY GEORGE LUCAS. After directing 1969's The Rain People, Francis Ford Coppola’s production company, American Zoetrope, was given a development deal from Warner Bros. Pictures to produce films from new scripts. The script Coppola liked out of the bunch his friends gave him was Milius’ Apocalypse Now. After years of development, the plan was to have George Lucas shoot the movie on 16mm black and white film in Stockton, California on a shoestring budget in a pseudo-documentary style similar to the famous war film The Battle of Algiers. The project languished in development for years, and Lucas eventually dropped out of the project to direct a script he had written. The movie he eventually made was Star Wars. Following his successes with The Godfather, The Godfather Part II, and The Conversation, Coppola agreed to direct the movie. 3. THE TITLE CAME FROM MILIUS MAKING FUN OF HIPPIES. An early title Milius had for the movie was The Psychedelic Soldier, but it was soon changed to the moniker it is today. Milius got the label by putting a contrarian spin on “Nirvana Now,” a slogan used by California hippies, which meant to get high and reach a state of pure consciousness. The actual title is never mentioned in the actual movie, but graffiti saying “Our motto: Apocalypse Now” can be seen on the front of Kurtz’s compound as Willard walks up the stone steps. It was added by Coppola because the title and copyright legally had to appear somewhere in the movie according to union regulations. 4. THE OPENING SHOT WAS CREATED FROM LEFTOVER FOOTAGE. Coppola shot an unprecedented 1.5 million feet of film for the movie, and came upon the opening shot by accident during the post-production editing process. In the editing bay, Coppola asked editor Richard Marks (who was one of four people who edited the movie) about reels of footage that were in the garbage. Marks replied it was static footage from an unused angle from one of the six cameras used to shoot the napalm scene. Coppola liked the eerie geometry of the trees and the helicopters whizzing by, and told Marks to cut it together with a song from The Doors called “The End” because he thought it’d be humorous to start the movie with a song of that title. 5. HARVEY KEITEL WAS FIRST HIRED TO PLAY WILLARD. Coppola held exhaustive audition sessions for his primary cast, but the part of Willard proved to be a problematic one for Coppola. He first offered the part to actor Steve McQueen, who turned down the role because he didn’t want to shoot in the jungle on location. Al Pacino, James Caan, and Jack Nicholson all turned down successive offers from Coppola until he gave the role to Harvey Keitel. Coppola fired Keitel six weeks into production because he thought the actor’s performance wasn’t as introspective as he needed for the character. So he called Martin Sheen, who had previously auditioned for the role of Michael Corleone in The Godfather and passed on Apocalypse Now because he was shooting The Cassandra Crossing in Rome. 6. COPPOLA LITERALLY PUT EVERYTHING HE HAD INTO THE MOVIE. The director invested $30 million of his own money into the project to get the budget to the amount required to execute his vision. That total included the valuations of his house and his winery, which he signed over to Chase Bank as collateral on the amount. The interest rate for the amount began at seven percent, but when production ended it was up to 29 percent. If the movie tanked, Coppola faced financial ruin, which understandably made the filming process fairly stressful. Coppola suffered an epileptic seizure while shooting, had a nervous breakdown, and allegedly threatened to commit suicide at least three times. 7. THE FILM WENT OVER BUDGET AND WAY OVER SCHEDULE. Coppola planned an initial 14-week shoot for the movie in the Philippines in the spring of 1976, which was on schedule until Typhoon Olga ruined nearly all of the sets and equipment, forcing the production to shut down for eight weeks. Coppola continued to shoot with reckless abandon thereafter, and principal photography didn’t conclude until May of 1977. Post-production on the movie lasted for a further two years, and the movie was finally released in August of 1979. 8. HARRISON FORD APPEARS IN A (TECHNICALLY) PRE-STAR WARS ROLE. Coppola hired a young actor named Harrison Ford to appear as Colonel Lucas (a nod to George), one of the military officers who gives Willard his orders to assassinate Kurtz. Ford had previously appeared in Lucas’ American Graffiti and Coppola’s The Conversation, but was still relatively unknown when the filming of Apocalypse Now began in 1976. He would later become a megastar after appearing as Han Solo in Star Wars when it was released in 1977. Apocalypse Now, which was shot before Star Wars, was released afterwards. Ford was apparently so nervous when shooting his scenes that Coppola added a story beat for his character to drop his dossier about Kurtz as a way to incorporate the then young actor’s anxiety into the scene. 9. IT WAS SHOT ON LOCATION NEAR VIETNAM. Inspired by Haskell Wexler's 1969 film Medium Cool, which had shot footage during the 1968 Democratic National Convention riot in Chicago and incorporated it into the plot, Milius wanted to shoot the movie on location in Vietnam while the war was still being fought. Coppola rejected the idea, and eventually shot the movie on location in the Philippines because President Ferdinand Marcos has agreed to lend the production as many helicopters and gunships as they needed. The U.S. Department of Defense, then led by Donald Rumsfeld, had denied the film any assistance due to its anti-Vietnam message. 10. COPPOLA HAS HIS OWN QUICK CAMEO. Coppola, along with production designer Dean Tavoularis and cinematographer Vittorio Storaro, appears in a cameo as the newsreel director telling Willard and the boat crew not to look at the camera during the rendezvous scene with Colonel Kilgore. 11. AUTHOR MICHAEL HERR WROTE THE NARRATION. Part of the extended post-production process included the addition of an entire voiceover track for Willard. 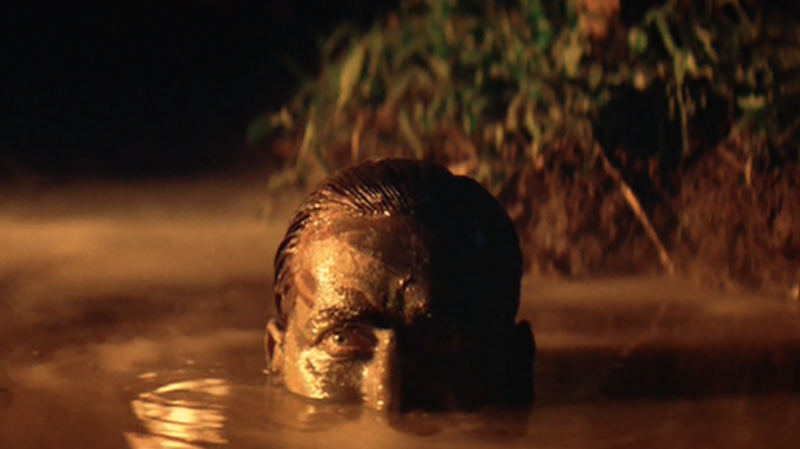 In 1978, Coppola hired writer and Vietnam War correspondent Michael Herr to write whole selections of possible voiceover parts that he could pick and choose from to give to the character. Coppola initially got in touch with Herr for the narration because he loved his book Dispatches, a collection of Herr’s experiences during the war. 12. COPPOLA WAS FRIENDS WITH THE DOORS. Coppola went to UCLA film school with all of the members of The Doors, including Jim Morrison, who agreed to let Coppola use the master recordings of their music for his Vietnam film. The five-and-a-half-hour early assembly cut of the movie was scored entirely using songs by The Doors before an actual score was created. 13. MARLON BRANDO WAS A BIG DEAL. Brando, who previously won an Oscar as Vito Corleone in Coppola’s The Godfather, showed up on location in the Philippines weighing in at over 300 pounds. All of his costumes had to be scrapped because Coppola expected the actor to show up as an astute and fit Green Beret soldier. This forced Coppola to have to come up with a way to shoot around Brando’s weight, so he and cinematographer Vittorio Storaro thought of shooting him in shadows and silhouettes to make his character seem more mysterious. 14. BRANDO WAS THERE TO COLLECT HIS PAYCHECK. Brando’s contract stipulated that he would be paid $3 million for four weeks of work on weekdays only, and that he would not be required to work past 5:30 p.m. For his first four scheduled days of shooting, Brando didn’t show up to set, but instead wrangled Coppola in his trailer to talk about random topics to ostensibly stall the movie and simply collect his acting fee. When Coppola finally got him on the subject of how to play Kurtz, Brando rejected all of his ideas, including the suggestion to play him as a bald man like in the book. When Brando said he’d sleep on it, he finally showed up to set the next day with a shaved head and told Coppola he’d finally red Heart of Darkness the night before and decided to play him like the character in the book. 15. DENNIS HOPPER’S CHARACTER WAS IMPROVISED. Originally, Hopper was supposed to play Colby, the Special Forces Captain (eventually played by actor Scott Glen) who abandons his mission to join up with Kurtz’s primitive followers after he is sent in to assassinate Kurtz before Willard. But Coppola didn’t like him in the part once he got on the set. Instead, Coppola created the drugged-out war correspondent photographer on the spot, giving Hopper a peasant shirt, necklaces, and a bunch of cameras to hang from his neck. The director modeled the new character after a character in Conrad’s book simply referred to as The Russian. Nearly all of Hopper’s dialogue, including the T.S. Eliot quotes, was improvised. 16. COPPOLA ALSO MADE UP THE ENDING AS HE WENT ALONG. The original ending in Milius’ script had North Vietnamese forces attacking Kurtz and his followers in a giant climactic battle, but Coppola scrapped it because he felt it didn’t fit with the movie he was making. Instead, he took the advice of his UCLA friend Dennis Jakob and actor Dennis Hopper to create a more mythical ending of the concepts of death and rebirth. Using the story of the “Fisher King” found in books like The Golden Bough and From Ritual to Romance and the poetry of T.S. Eliot (all of which can be seen in Kurtz’s possession in the film), Coppola devised a new ending wherein Willard would kill Kurtz and ostensibly become his followers’ new king. 17. COPPOLA WANTED TO HAVE NO CREDITS, BUT A CREDIT SEQUENCE EXISTS. Original presentations of the movie came with a specially made program that included a full list of cast and crew to stand in for the credits, which Coppola intentionally left out of the film. But the studio forced him to create a credit sequence to tack on to subsequent showings of the movie. Coppola eventually created one that featured the credits over images of Kurtz’s camp being firebombed. When Coppola felt the anarchic message of destroying Kurtz’s leftover followers went against his downtrodden but anti-war message, Coppola decided against the credits sequence.